Following claims in some quarters that he may have abandoned the assignment given to him by President Muhammadu Buhari where he was mandated to reconcile aggrieved All Progressives Congress members, national leader of the APC, Asiwaju Bola Tinubu has insisted that the assignment is ongoing and that he is on the verge of turning in an interim report. accusing the chairman of sabotaging the assignment given to him by the President. 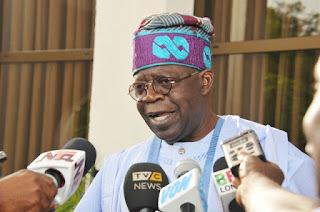 Speaking through his media aide, Tunde Rahman on RayPower’s political platform, the former Lagos governor stressed on Tuesday that he would give progress report of the consultation, reconciliation and confidence building assignment only to President Buhari who saddled him with the responsibility. Rahman said, “The assignment given to Asiwaju by President Muhammadu Buhari to lead the consultation, reconciliation and confidence building efforts within the party is ongoing. He has gone so far in that assignment; as a matter of fact, he is about putting together an interim report for submission to the President. I’m not aware that it was slated to be done yesterday (at the APC national caucus meeting.